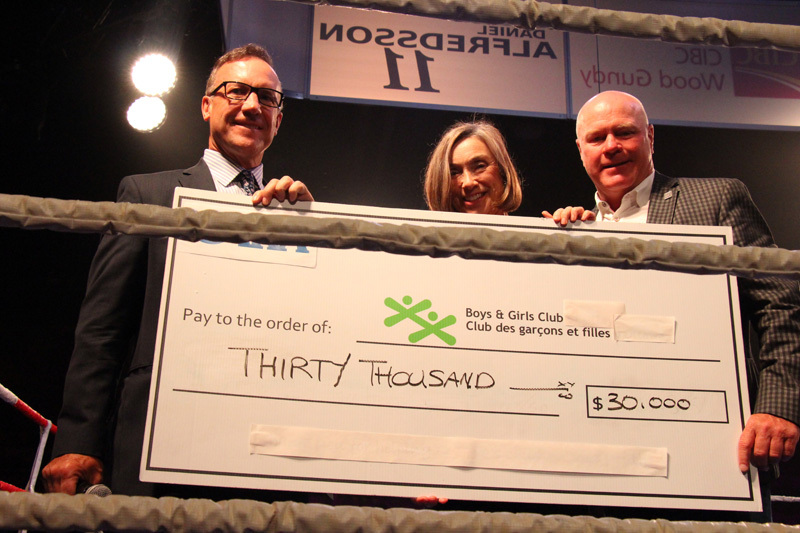 It was a night full of political knockouts, but just as exciting as the Ontario election were the punches and jabs being thrown back and forth at Ringside for Youth XXIV, an annual charity boxing night held for the Boys and Girls Club of Ottawa. A sold-out crowd of 1,200 headed into the Shaw Centre for cocktails and dinner before cheering on amateur fighters duking it out in the ring. 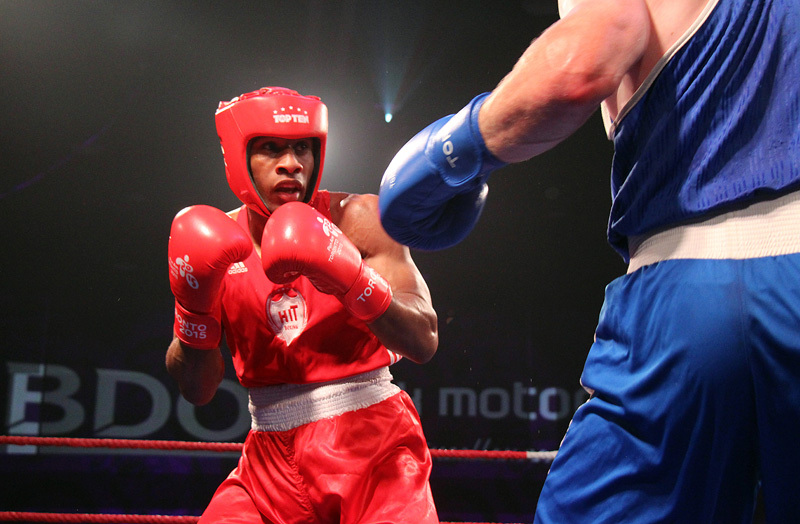 Several competitors were from Ottawa’s Beaver Boxing Club while others came from St. Catharines, Montreal and even Gothenburg, Sweden. Hanging proudly in the large hall were banners with the names of all the boxing greats who have supported the fundraiser since its humble beginnings in 1995, starting with Canadian boxer George Chuvalo. The popular event, founded by Steve Gallant, branch manager, investment advisor and vice president with CIBC Wood Gundy, has raised more than $3.2 million, to date. Ringside was expected to net between $180,000 and $200,000 this year. Gallant is part of a 24-member, well-oiled committee that puts on a slick show each year. The group, chaired by Jeff O'Reilly, general manager of D'Arcy McGee's Irish Pub, has been together for so long that it's now entering its second-generation of volunteers. This year’s special boxing guest was undefeated American light heavyweight champion Andre Ward, who only announced his unexpected retirement last September. He was first introduced to boxing at the age of nine because his father wanted to toughen him up. With Virgil Hunter as his trainer, Ward went on to have an illustrious boxing career that saw him win an Olympic gold medal in 2004. Ward was so humble and well-grounded as he spoke with celebrity guest announcer Rod Smith, who's an excellent interviewer, by the way. The retired athlete talked about his decision to quit boxing at age 33, while he still had “something left in the tank.” He had listened to many boxers talk a good game about their plans to hang up their gloves once they’d made their mark and had a great run. But, they didn't get out, he said. As well, he followed his father's career advice to stick with a close-knit circle of friends and family. He told Ward: If you ever make it, don’t have 50 guys around you, patting you on the back and telling you how great you are. “It was lessons like that, amongst many others, that allowed me to avoid major pitfalls that professional athletes have to deal with,” said Ward. Ward also talked about how he had to dumb down his boxing for his fighting role in Creed, a 2015 spin-off film and sequel to the Rocky film series (he’s starring in the upcoming Creed II, as well). The event, presented by former Ottawa Senators captain Daniel Alfredsson, Manulife Investments, Mark Motors of Ottawa and CIBC Wood Gundy, had dozens of other businesses also in its corner that night. Among the returning celebrities were former heavyweight boxer Gerry Cooney as Ringside for Youth ambassador, Ottawa’s Derick Fage, co-host of Breakfast Television Montreal, as ring announcer and Ottawa-raised comedian Angelo Tsarouchas as emcee. The reaction was mixed when Tsarouchas announced the results of the provincial election – a Tory majority win – later that night. Musical guests included JW Jones while singers Rebecca Noelle and Kellylee Evans did a beautiful job belting out the national anthems. Even though Alfredsson wasn’t able to attend, his younger brother Henric Alfredsson did, and was spotted singing along to the national anthem of Sweden. Seen was Cindy Tomlinson Keon, vice-president of Tomlinson Construction, which made a $1 million donation to the Boys and Girls Club of Ottawa last year. Cody Ceci and his Ottawa Senators teammate Mark Stone attended, as did retired player Chris Phillips. Former Ottawa mayor Jim Durrell, chair of Hydro Ottawa's board of directors, was also in the crowd. The BGCO board is chaired by well-known Ottawa restaurateur and all-around nice guy Stephen Beckta.